……the more color..the more flavor!!!! 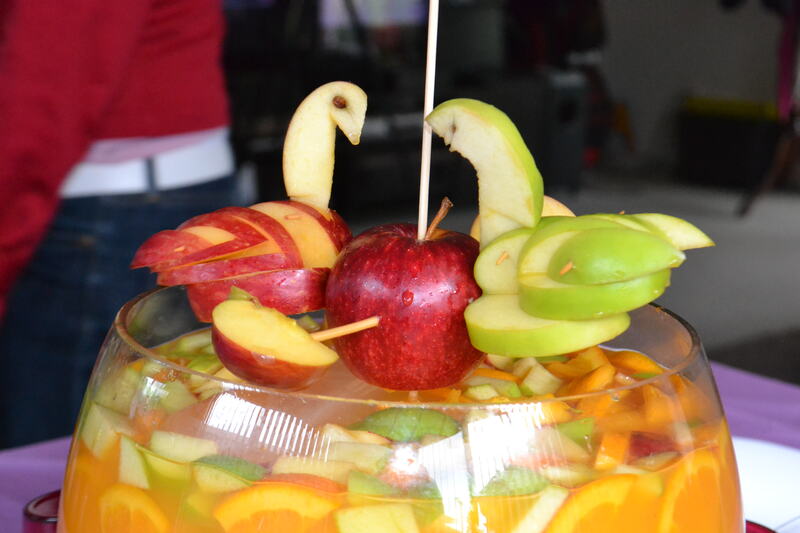 Just sharing a classic fruit punch with apple swan….Ingredients? any fruit you want like apples, oranges, grapes, melon, strawberries. I always limit 4-5 fruits in a bowl of tropical fruit juice or simply fresh orange juice. You may add wine or some vodka, gin if you want depending on your guest needs………love it……….Did you know that those who ate the most apples had a 50 percent lower risk of developing lung cancer and people who eat two apples per day may lower their cholesterol level. ….And eating green apples lets you awake at night???? believe it or not, its up to you……happy apple eating! a simple person who loves to cook!! .....so ride with me as we explore ........"a journey to different cuisines"
Posted on August 27, 2014, in Uncategorized. Bookmark the permalink. 1 Comment.